We introduce optimal transport based resampling in adaptive SMC. We consider elliptic inverse problems of inferring hydraulic conductivity from pressure measurements. We consider two parametrizations of hydraulic conductivity: by Gaussian random field, and by a set of scalar (non-)Gaussian distributed parameters and Gaussian random fields. We show that for scalar parameters optimal transport based SMC performs comparably to monomial based SMC but for Gaussian high- dimensional random fields optimal transport based SMC outperforms monomial based SMC. When comparing to ensemble Kalman inversion with mutation (EKI), we observe that for Gaussian random fields, optimal transport based SMC gives comparable or worse performance than EKI depending on the complexity of the parametrization. For non-Gaussian distributed parameters optimal transport based SMC outperforms EKI. Ruchi, S, Dubinkina, S, & Iglesias, M.A. (2019). 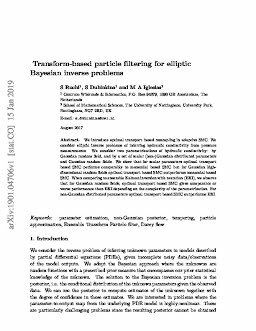 Transform-based particle filtering for elliptic Bayesian inverse problems.